I have a lot of Breyer models for sale. They are all listed on MH$P (www.modelhorsesalespages.com) and some are also listed on eBay. Many of them are still in their boxes. 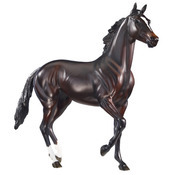 Model Horse BLAB forum user spookhorse01 has posted information about the limited edition portrait models which Breyer is creating just for the World Equestrian Games (WEG) in Kentucky. Some really nice models on this list! Gold Raven, a gray version of Oasis (the Make A Wish mold with raised head and tail). This eight year old Arabian mare is an endurance racing champ, who recently won the test event for the World Equestrian Games under unusual weather conditions that made the race so difficult that officials cut it short - from 100 miles to "only" 75! Zenyatta Gets Her Breyer Model! The latest issue of Just About Horses is hitting collectors' mailboxes this week, and there is much to squee about. Not least of which being Breyer's announcement of a Zenyatta portrait model! A sharp-eyed BLAB user spotted a video with the real Zenyatta and her trainer being introduced to the Breyer version. It's pretty cute! Read more about Zenyatta Gets Her Breyer Model! Collecting Vs Hoarding: Where's The Line? I think just about every collectible community has been rocked by the recent spate of shows about hoarding. The Breyer community has been quietly abuzz about an episode of TLC's show Hoarding: Buried Alive that features a Breyer collector (Season 2 episode 3, "Prison of Garbage"). 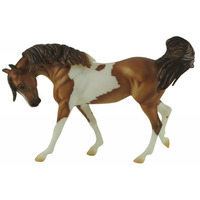 One could argue that even one Breyer model is more than you need, given that they serve no "useful" purpose. But where is the line, really? Read more about Collecting Vs Hoarding: Where's The Line? All accessories are made by me. I can make custom ones. Order a custom one on my website! This pretty fellow was offered up in a super limited edition, and sold out within about an hour. Breyer called him "a beautiful reminder of the summer of 2010," which is as fitting an end to summer as anything! Sad to think that summer has finally come to an end, but I'm afraid it's true. Summer Love is a red dun pinto, using the Make A Wish mold which was created by Kathleen Moody in 2009. According to the Identify Your Breyer website, so far Make A Wish has been used only twice before: as a BreyerFest tent special palomino in 2009 (only 1,350 made), and as a BreyerFest Live Auction special in dapple gray (only 1 made).